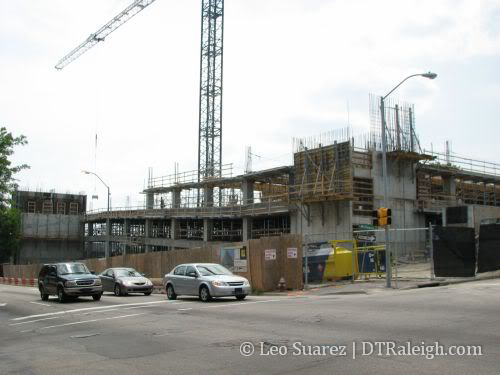 The parking deck at the corner of McDowell and Davie St. is starting to rise out of the ground. This is also the site of the future ‘The L’, office over retail building, which will hide the deck from the sidewalk. At this pace, do not expect it any time soon because this deck will be nine stories tall and they are not building it lego-style like RBC’s deck. At least we will all feel safe parking in this slowly built deck. Based on what I know, Empire Properties should break ground this month – it is part of the contract, I think. Any delays will be caused by the progress of the parking deck, not the developer. Besides, this is the first major project Empire Properties has to deliver. Once this is done, they can move on to Lafayette and a few other visions right after that. As customary in DT Raleigh, this is another missed opportunity for something big :( This spot deserved something MUCH taller and bigger. They should have incorporated the parking deck inside a nice 20+ story tower, not just wrap the parking deck with a building. I am happy for the redevelopment effort, but it feels to me like a wasted opportunity. Deep pockets is also the problem in most cases. You can see that happening with The Hillsborough and 630 North Street. Even developers with lots of money to back up their visions cannot deliver big, sometimes :( Oh, well!!! Let’s hope that nothing below 50 floors goes across from there (between the County Jail and the new convention center). If I don’t see something above 600ft (not including crown and spire) I will definitely scream out loud. Since the parking deck is to serve the future safety center expansion, I thought this land was county property. I do not think the county has any interest in good development for downtown and it may be hard to convince them otherwise. It is a huge positive that the pedestrian experience will be enhanced and Davie St. may be a key connector between Fayetteville St. and the warehouse district. Cabarrus St. may be used but Davie could become the more attractive route from city plaza and surrounding hotels to this district. ^Good point, Leo. It could eventually help get something more permanent in the Depot complex by providing a pedestrian-friendly corridor connecting it to Fayetteville Street and City Market. Leo, you will be surprised to hear this, but if I heard right, someone from the county suggested a much larger building and the developer didn’t like the idea. I am not 100% certain, but my source was reliable, kind of insider – unless he didn’t hear right. Did not like the idea? That could go two ways, I think. If I was a developer, I would hate the idea of going taller because maybe the market will not support it and I could lose some serious cash. If going really tall in Raleigh is very risky then I understand. 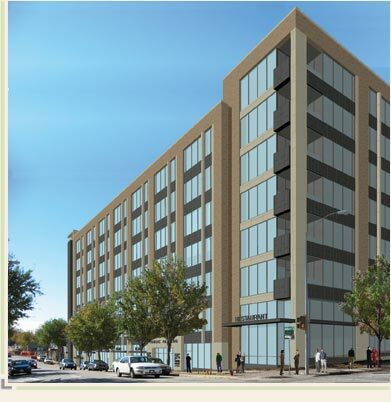 However, not liking the idea simply because it is tall and you prefer wider buildings with a suburban flavor, well then I think DTR is not your market. While there are still lots of areas where we can grow, I think even today we still need to push for density and good use of all the space we have. Which translates to going up and not sideways! Let’s just agree to be glad this one is actually getting built. The debacle of the Reynolds delays at the Hillsborough site is the one that is certainly on the frustrating side! Deep inside I am very happy for getting the L Building. I know it could have been better, but it could have been worse, too. I am confident that the final product will look good. As to why the developer – allegedly – didn’t like the idea of a taller building, although the foundation could support it, I am sure it had little to do with the market. If you are a developer you want to make the most out of your investment, as Lafayette clearly indicates. The developer could go bigger, but he chose not to. If you finances do not allow, then you do not jump into a deal with both feet. raleighrob, The Hillsborough has become a huge disappointment for me. Having met with the developers, I must say I was impressed with how down to Earth and supportive of downtown they were, and continue to be. They are good people, who wish to do as much as possible, and they are frustrated even more with the current status of their vision. However, they made a HUGE mistake, IMHO. They waited too long :( The city council was partially to blame for some of this mess. When the developers brought forth the revision for the 24-story tower, the city officials should have immediately rejected it and move into releasing an RFP for that site. Yes, times are rough for developers without deep pockets these days, but if they can’t get financing we’ll be stuck with a hole in the ground for a while, or with a stupid parking lot, if the city approves that idea. Anyway, we should be happy about the progress, but we can still hope for better things to come, not just compromises. Which is better… a nice building going up in a place we would have never imagined 5 years ago, or a giant parking deck with nothing? Sorry, retail and residential are the most important elements for DTR to thrive, and L-bldg will fit the bill nicely. Skyscrapers are “cool” to admire from a distance, but projects like this help stitch the downtown together, block-by-block. And BTW, Empire has done more for DTR recently than any other developer IMO. They could have pushed for a taller building, but we would have likely been left with empty promises like The Hillsborough. BTW, I blame Reynolds for that debacle. They should have never tried to include the office component in the first place (early 07 submittal). Had they gone with hotel/residential/retail, it would be under construction by now. The parking lot idea is only to try to extract some quick cash for the city from an otherwise useless hole.